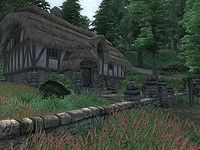 Faregyl Inn is an inn off the Green Road, between the Imperial City and Bravil (quest-related). It is found just northwest of the Inn of Ill Omen. The publican, Abhuki, offers Advanced Alteration Training. She will also buy potions and food while only selling the latter and four samples of Root Pulp. The ground floor contains the reception area, consisting of a bar with a counter and a dining room, all laden with food and drinks. Behind the counter is Abhuki's bedroll, which you cannot sleep in. On the other hand there is a free bed in a small room, on a lower level. The other rooms can be found upstairs. The room you can rent is the first on the right. It is well-lit and contains a chest and a lower-class double bed. The second on the right, which is locked, contains a single bed, but you cannot sleep in it. The other room, which is also locked, contains a free double bed. The Potato Snatcher: S'jirra has had her potatoes stolen! Faregyl Inn appears in ESO as Castle Faregyl. Directly across the road is a Wayshrine of Zenithar. Go behind the counter to the left and there is a free unowned bed. Adamus Phillida owns the rentable room here. This has no effect on gameplay, since ownership is reset after you first rent a room here, and was done so that the publican Abhuki won't trespass there. This page was last modified on 8 July 2018, at 15:48.